Meeting customer expectations can be tough, but exceeding them consistently introduces a whole new set of challenges. How do you build fresh excitement around a new product when customers have become comfortably numb? This was the challenge facing Dave Sierk, Consumer & Small Business Email Strategist, Dell, who shared an interesting case study at MarketingSherpa Email Summit 2013 on Dell’s approach to tackling this problem for a new product’s launch. In today’s MarketingSherpa Blog post, let’s take a look at the throwback creative Dave and his team used to effectively communicate value. Dell launches a few products a year, and as you would expect, most of them are laptops. 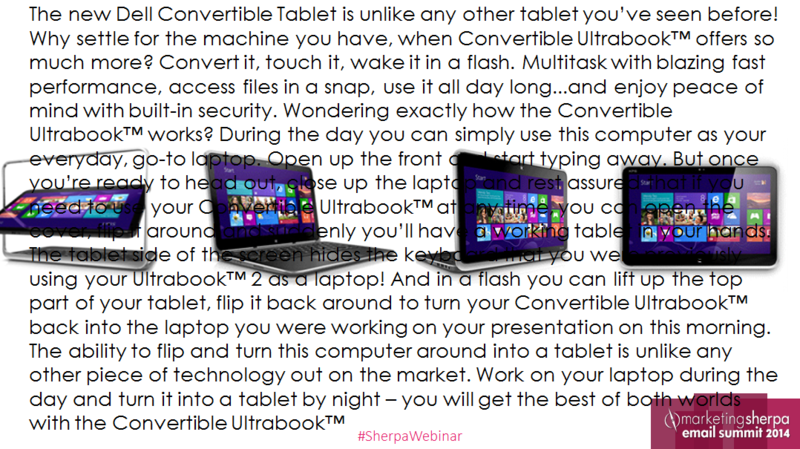 When the team prepared to launch the XPS 12 Convertible Ultrabook, a laptop that can transform from a laptop to a tablet, they realized communicating the new product’s value effectively would prove a little tricky. A versatile range of motion is one of the core values of the product. How do you communicate that aspect through an email using text or images? Image stills do not fully deliver the product’s fluid range of motion, and a wall of descriptive text telling customers about it is not very appealing either. While the laptop’s motion could be demonstrated at a brick-and-mortar store, the gap in effectively demonstrating the product online would remain unsolved. 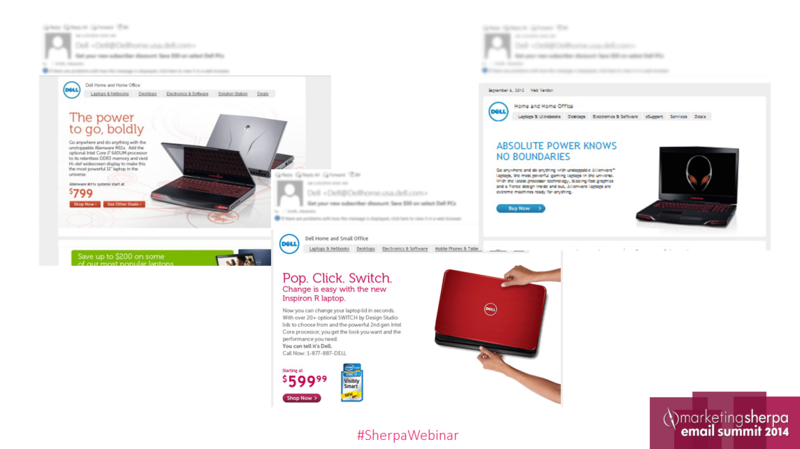 The team decided to use a GIF to illustrate the product’s full range of motion in the email campaign. Another advantage of using this throwback to the 90s was that the GIF solved the problem of showing online users how the product worked. “It’s a great way for a customer to get a full understanding of how that product is going to work in their hands,” Dave said. After Dell compared the campaign’s performance against internal benchmarks, it proved a success. Dave’s team increased conversion 103% and boosted revenue 109%. This example also serves as a reminder as to why capturing and delivering a value proposition is vital to your email efforts versus just plugging a few product images and text in an email and hoping for the best. You have to go beyond just sharing what something is with customers and show them why it’s the ideal solution for them. What a great idea! Thanks for sharing, John! I’m really not sure how they did it. This kind of email marketing was already being done. I think the new product was itself something interesting and an easy sell.